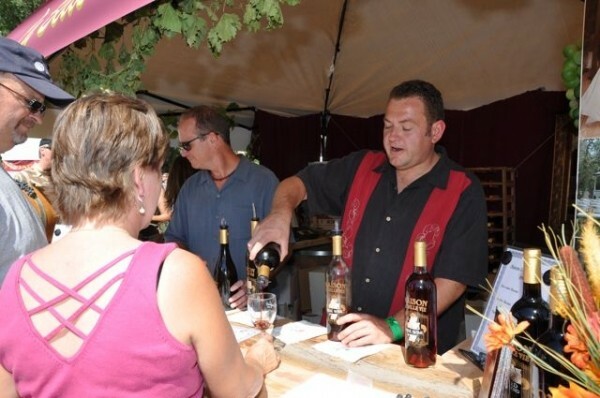 Winemakers in the Grand Valley, just past the Utah-Colorado border, are more than just ready to have you taste their wines; they’ll also teach you about their vineyards and let you get your I Love Lucy on by stomping grapes at the 21st-annual Colorado Mountain Winefest in Palisade. Events run Sept. 13 to 16, with the main focus being on Saturday, Sept. 15, where buying a ticket ($43) gets you a glass, wine tote, free classes and demonstrations and unlimited wine samples. You read that right: unlimited. We visited Whitewater Hill Vineyards (220 32 Road, Grand Junction, 970-434-6868, WhitewaterHill.com) right after Nancy Janes—who goes by the title “owner/winemaker”—had just snipped some wine grapes to be tested and had us try some. As we tasted the petite grapes’ sweet and robust flavor, we were interested to learn about how she and her husband left behind jobs as computer programmers 15 years ago to try growing grapes on Colorado’s Front Range, which is about the time many other vintners were coming to the area. Palisade is also home to Meadery of the Rockies (3701 G Road, 877-858-6330, MeaderyOfTheRockies.com), producing tasty honey-based wines; Peach Street Distillers (144 S. Kluge Ave., 970-464-1128, PeachStreetDistillers.com), putting out vodka, gin, bourbon and brandy sweetened with local fruits; and Palisade Brewing Company (200 Peach Ave., 970-464-1462, PalisadeBrewingCompany.com), providing several different beers. For those who visit on one of the 51 weekends other than Winefest, it’s easy to tour the wineries one by one since they are close together in the same valley. Popular ways to get around include by bike, taking a horse-drawn carriage with Absolute Prestige Limousine (970-858-8500, APLimo.com), or car service and a guided tour with A Touch With Class Limousine (970-245-5466, Colorado-Limo.com). Enjoying a wine weekend is made even better by having local food to pair the wines with and a good place to stay. For hotels, Colorado Wine Country Inn (888-855-8330, ColoradoWineCountryInn.com) has vineyards on the property and even produces its own wine. A DiVine Thyme B&B (404 W. First St., 970-464-9144, ADiVineThymeBandB.com) is set in a traditional Victorian house located near the Palisade town center. You can find fresh, local flavors at Inari’s Bistro (336 Main, 970-464-4911, InarisBistro.com) in the heart of Palisade. Le Rouge French Restaurant & Piano Bar (317 Main, 970-257-1777, LeRougeRestaurant.com) in downtown Grand Junction serves traditional French entrees along with wines from Frenchman John Barbier’s Maison la Belle Vie vineyards (3575 G Road, 970-464-4959, MaisonLaBelleVie.com). Before there were wineries in Grand Valley, the place was known for its outdoor offerings, with the local joke being that you can do just about anything ending in “-ing” in a place surrounded by the Colorado National Monument, the Book Cliffs mountains and Grand Mesa, a 500-square-mile area that sits at 11,000 feet overlooking the valley. Kathleen Curry and Geoff Griffin write and blog about their treks near and far for City Weekly and host the weekly Travel Brigade Radio Show. Follow them on Twitter: @TravelBrigade.